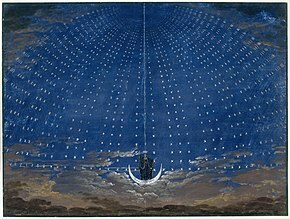 The Magic Flute (German: Die Zauberflöte), K. 620, is an opera in twa acts bi Wolfgang Amadeus Mozart tae a German libretto bi Emanuel Schikaneder. The wirk is in the form o a Singspiel, a popular form that includit baith sangin an spoken dialogue. [lower-alpha 1] The wirk premiered on 30 September 1791 at Schikaneder's theatre, the Freihaus-Theater auf der Wieden in Vienna, juist twa months afore the componer's premature daith. ↑ Berger & Foil 2007, p. 11. This page wis last eeditit on 28 August 2016, at 16:27.